Affixed to a car, the number 300 might not mean too much anymore nowadays, but back in the 1950s and 1960s that number carried a lot of weight in the automotive world. Chrysler used it for its V8 hemi powered fast C-300 starting in 1955 and is still using it successfully today. The same goes for Daimler-Benz. 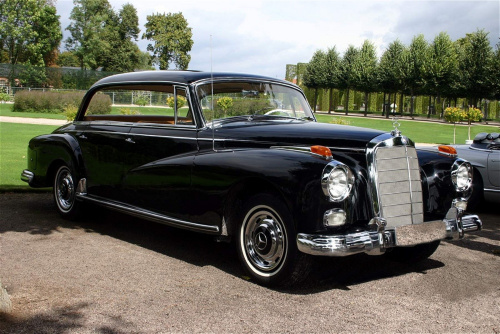 A Mercedes 300 Adenauer was back in the early 1950s a top luxury automobile, reserved for the rich and famous. Today that number can be seen with various derivations on anything from the C- to the S-class. 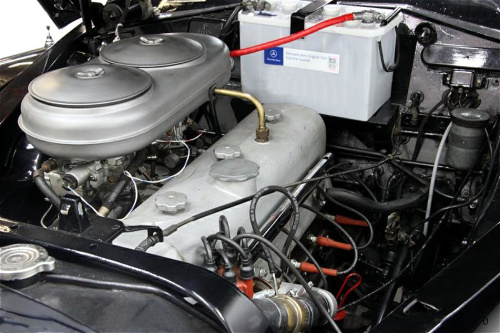 While in case of the Chrysler C-300 the number disclosed the horsepower under the hood, for the Mercedes 300 Adenauer it was a guide to the engine displacement. When the 300 was introduced together with its smaller brother the 220 in April 1951 at the Frankfurt Automobile Show, it created quite a stir. 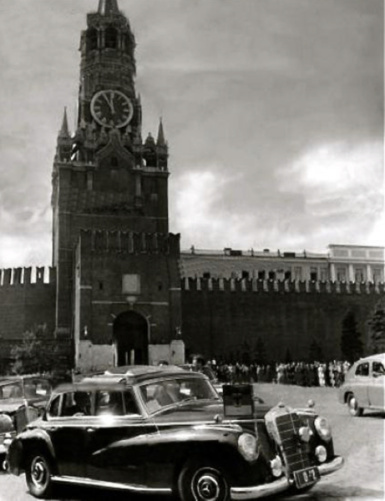 People had not expected such a vehicle from Daimler-Benz just a few years after the war. It was not just the public that adored the car, also the press was highly impressed. The car was not the only thing that was impressive, the price was impressive too. At 19,900.- DM ($4,720.-) very few people were able to afford the car. In North America it was launched in 1953 and was even more expensive at $6,500.-. A top of the range Cadillac 75 Fleetwood with a large V8 engine, a longer wheelbase and plenty of luxury goodies was at $5,820.- almost a bargain compared with the Mercedes 300 Adenauer. Customers did not seem to mind though and the price guaranteed exclusivity for the rich. No wonder stars like Errol Flynn, Gary Cooper, Yul Brunner, Anthony Quinn, King Gustaf Adolph of Sweden, Frank Lloyd Wright and the Aga Khan all owned one. 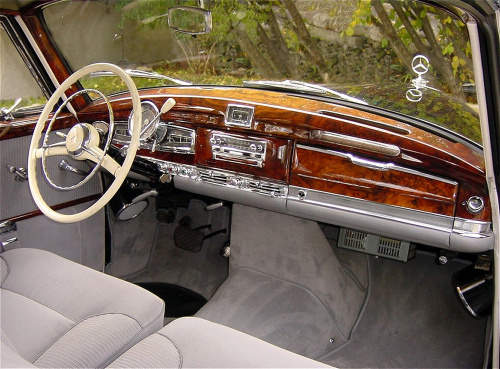 Also the pope had a special 300d Pullman Landaulet made for himself in 1960. But the person most closely associated with the 300 was the German chancellor Konrad Adenauer, who had six of them during his tenure. The last one he owned until his death in 1967. 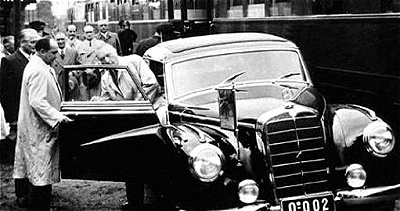 No wonder the car is remembered by aficionados as the Mercedes 300 Adenauer (If you are interested to read more about Adenauer and his 300, please go to my website, where you can download the respective book and e-book. You’ll find both also on Amazon). 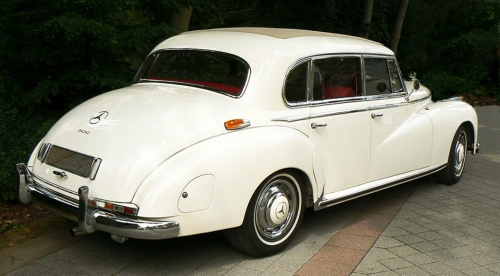 The body of the Mercedes 300 Adenauer was still built on a traditional cruciform oval-tubed chassis, which was designed already prior to World War II. In its basic set-up it was similar to the chassis used on the smaller 170 and 220. It also carried over the central lubrication system of these models. It might look a bit outdated, but it has to be said in its favor that a body-on-frame-construction was better suited for maintaining a high level of quality for cars produced in smaller numbers. Its overhead camshaft inline six-cylinder engine was very modern for early 1950’s standards. It was fed by two downdraft carburetors instead of one as in the Mercedes 220. With a top speed of 160 km/h (100 mph) it was quicker than its smaller sibling and established itself as the fastest sedan produced by a German car manufacturer. It was as fast as a Porsche 356 but offered of course considerably more comfort and space. Production lasted from 1951 to 1962. All in all four versions of the Mercedes 300 Adenauer have been produced: While the first three models differed mostly in technical and a few optical aspects, the last version 300d was not only larger and offered a more powerful fuel injected engine, it was also somewhat similar to American luxury cars of that time. It was the first Mercedes-Benz sedan with a hardtop roof. All four side windows could be lowered with their chromed frames, there was no B-pillar and even the rear quarter lights could be removed and stored in small pockets in the trunk. When a Webasto sunroof had been ordered, the car could almost pass as a cabriolet. 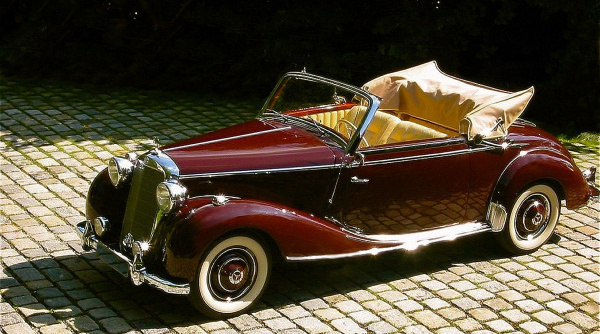 Although four-door cabriolets were available for all versions of the Mercedes 300 Adenauer, they were very expensive and only a few have been produced. The last cabriolet, based on the 300d, was even more expensive than the 300SL. Over a time span of eleven years, Daimler-Benz managed to sell 11,430 units of the Mercedes 300 Adenauer, of which just 707 were cabriolets. 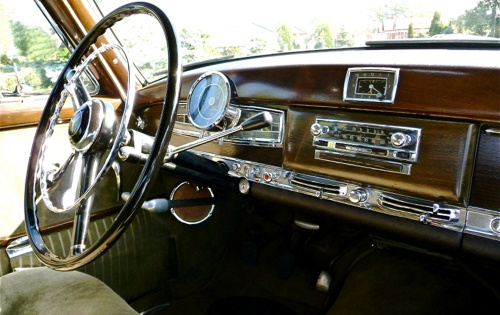 It is highly doubtful that the 300 had managed to live up to the sales expectations of Daimler-Benz management, but it had helped for certain to re-establish the image of Daimler-Benz as a leading manufacturer of luxury automobiles. 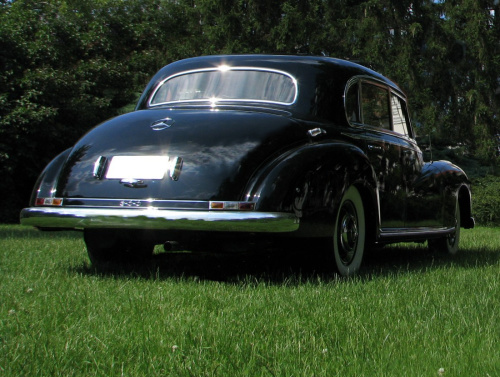 I hope that you liked the pictures and a bit of the history of the wonderful Mercedes 300 Adenauer. 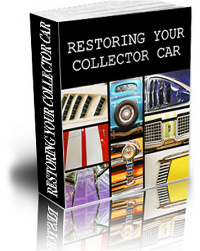 Much more of both and of other interesting Mercedes cars from the 1950s and 1960s you can see and read about in my books or e-books. More details can be found on my website. I am sure you will enjoy. A great blog with superb piece of writing. Really enjoyed reading your blog. Many thanks for your kind comments. I’m happy that you like my blog! My dad was personal friends with John Stiegler, owner and founder of Steigler MB in Encino, CA. 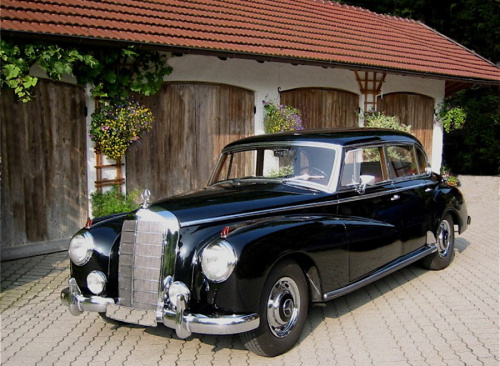 In around 1960, or 61, dad brought home a black 300 with red leather interior. It was a big sedan and the most beautiful car I had ever seen, then or since! Mr. Steigler gave it to my dad to try it out for a week and was going to sell it to my dad at his cost. The car was used. It was either a ’56 or ’57. Well, all my mother did was complain. First, she did not like the hanging accelerator pedal. After that it was the lack of air conditioning. In the end, my dad caved (very unlike him) and gave the car back with apologies. I was 54 when mom died, but before she went I told her I still held a grudge that she made dad give the car back. I would have had that car. My dad kept everything! Thank you for your comment about your memories re a used 300 Adenauer. Please accept my appologies for my late reply. The 300 was and is an absolute classic and I would have been as upset as you were with your mom 🙂 What did your mom want to have instead? A Chevy with air-con and power steering? of this blog post is not to tell you EVERYTHING Frederick Web Promotions can do to improve your ranking, the purpose of this particular blog post is to:.